A new breakthrough in microfluidics could lead to autonomous blood analysis chips that will be able to diagnose diseases in mere minutes. The device, called SIMBAS, was developed by a team of researchers from Dublin City Univerisity in Ireland, Universidad de Valparaiso Chile, and the Bay area's own University of California, Berkeley. 'SIMBAS' stands for 'Self-powered Integrated Microfluidic Blood Analysis System', and requires no extra tubing in order to diagnose diseases. The lack of extra components is especially important, as it helps keep the chip "small, portable, and cheap," according to UC Berkeley post-doctoral researcher in bioengineering, Ivan Dimov. "The dream of a true lab-on-a-chip has been around for awhile, but most systems developed thus far have not been truly autonomous." "For degas-driven flow, air molecules inside the porous polymeric device are removed by placing the device in a vacuum-sealed package. When the seal is broken, the device is brought to atmospheric conditions, and air molecules are reabsorbed into the device material. 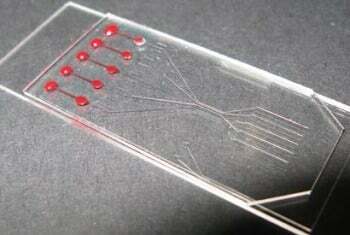 This generates a pressure difference, which drives the blood fluid flow in the chip." According to the researchers, they were able to capture more than 99 percent of the blood cells by separating the blood from plasma using this method. The team demonstrated its chip's ability by placing a 5-microliter sample of blood on the chip's inlets and receiving a read out of biotin levels in just 10 minutes. "Imagine if you had something as cheap and as easy to use as a pregnancy test, but that could quickly diagnose HIV and TB," said UC Berkeley grad student Benjamin Ross.